Weave a little magic and turn those too-small shoes hiding in your closet into decorative glass slippers. 1. Spray paint the shoe and let the paint dry completely. Gold, silver or bronze colors add glimmer and shine, but you can use any color that fits your decor. 2. Hot glue the glass stones randomly all over the shoe. 3. Cut a piece of oasis (green florist’s foam) to fit inside the shoe. 4. Cover up the foam with any type of dried moss. 5. 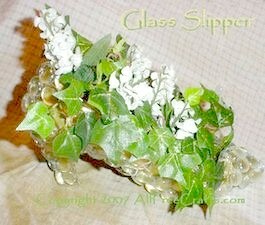 Add picks of silk ivy or vines, then add a mix of dried or silk floral accents. Small flowers, such as baby’s breath, can be used to fill in spaces, but single large flowers have appeal too. 6. If you wish to mount the slipper on a wood plaque, follow manufacturer’s instructions to stain or paint the plaque first, then seal with a good sealer. Let dry completely before gluing down the shoe.